Chikashige Morikawa (active 1869 - 82) Matching Pairs: The Contest of Power (Futatsu Tomoe Isei Kurabe), ca 1870’s. Oban Triptych. Little is known of the artist Chikashige. He was a pupil of Kunichika and produced mainly theatre pieces in triptych form such as the one above. The print is in fact a Chushingura piece, and it’s a very unusual and collectible one as well. The piece illustrates a bout of neck wrestling: this dangerous sport known as kunipiki has now fallen from favour and the specific rules are unknown. Prints of kunipiki are rare and this is a fine and intriguing example. 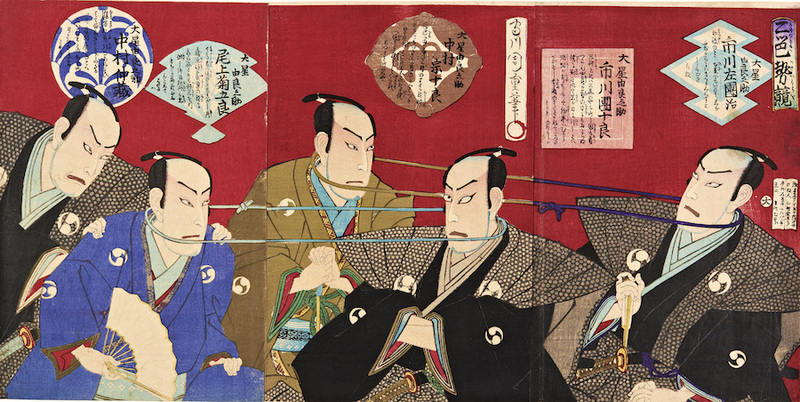 The print shows a group of popular kabuki actors in the roles of some of the principal characters from the Chushingura. The leader of the rebels, Oboshi Yuranosuke, played by Nakamura Chuzo at the far left is encouraging actors in a bout of kunipiki. 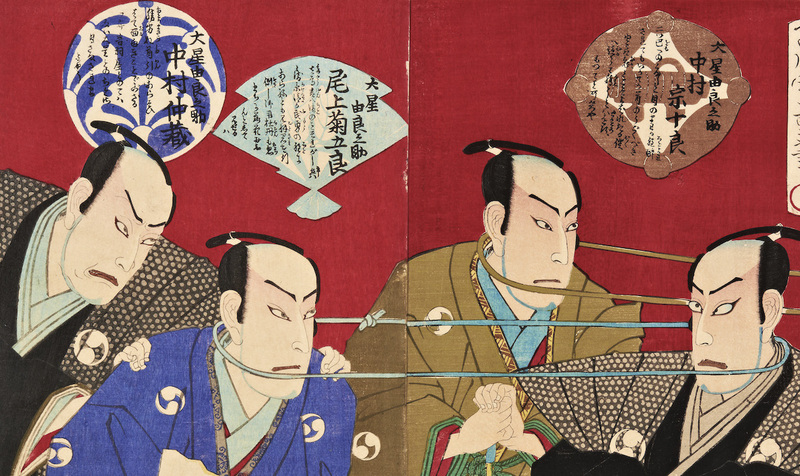 Onoe Kikugoro (second from left) is paired with Ichikawa Danjuro and Nakamura Sojuro is pitched against Ichikawa Sadanji. The contestants' crests are illustrated above, against the red ground, the distinctive mons of Yuranosuke - the futatsu-domoe - adorns the kimono of the contestants. The meaning here is quite clear - the actors are all compared to the great heroes of the day and they are to battle each other to determine who is the greater. A fine print and the more interesting because of its rare subject matter. Chikanobu produced a similar, though less bold version. The Chikashige is full size, colour, condition and impression are all excellent.